A more detailed problem statement can be found here. The code has been modularised into separate RIB files and using the ReadArchive command we patch the files together. Shaders are organised in SL files. A caustic map is separately generated as caus.cpm from caus.rib A makefile compiles everything and generates an image. transparent: This is a surface shader with very low local illumination and reflection. Most of the light is refracted and raytraced. 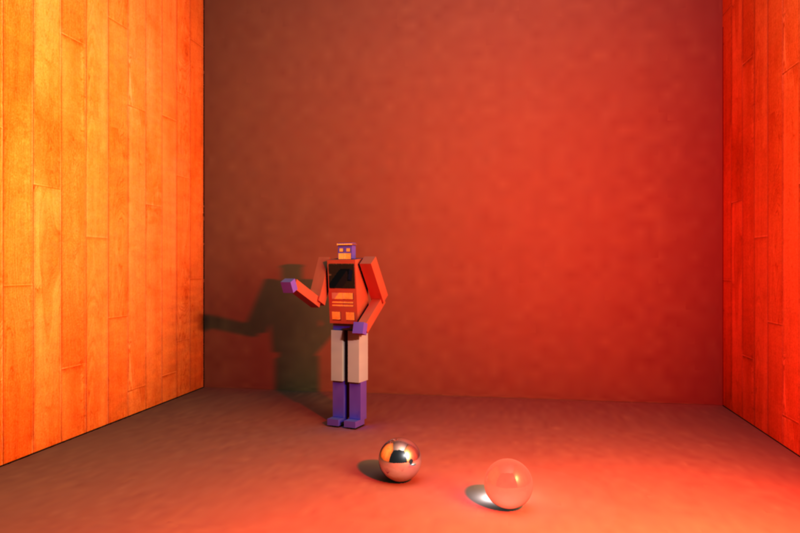 Color Bleeding: Using indirect illumination in the diffsurf and texsurf shaders. Area Lights and Soft Shadows: Placing multiple point lights closely. Texture Mapping: Using the texture function in texsurf shader. Caustics: Photon mapping the scene to generate a caustic map and then adding it to the illumination. Transparent and Metallic Surfaces: Using the transparent and metal shaders respectively. The generated tif can be downloaded from here.